In 1840 Suffolk Lodge was a large detached house with a sizeable garden to the south and a surgeon called Charles Salt lived here. Mr Salt had previously lived at number 16 Suffolk Parade, from at least 1830. After 1850 the residents of Suffolk Lodge changed quite often, indicating that the property may then have been a lodging house let to visitors to Cheltenham. The shop front had not yet been extended over the front garden. In about 1868 the house was bought by Mr John Balcomb, who was around 26 years old and was born in Cheltenham. Initially he lived here with his younger sister Mary Anne, who was his housekeeper. Mr Balcomb ran his chemists and druggists business at number 3 Suffolk Parade in the early 1870s but shortly after relocated the business to Suffolk Lodge. He sold most of the garden in 1870 and this was built upon in about 1872 to form the shops at 12, 13 and 14 Suffolk Parade. The developer was Henry Hill, who had until this time traded as a grocer at 15 Suffolk Parade but by now called himself a builder. 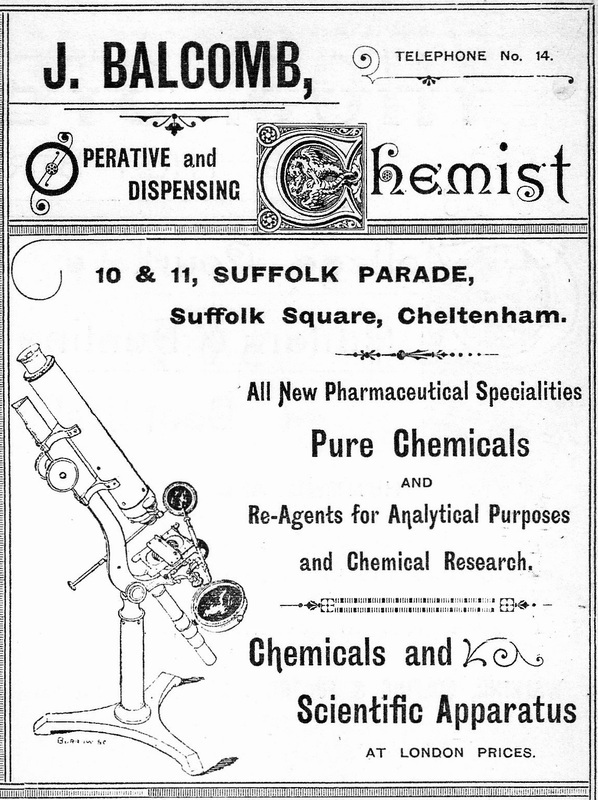 In addition to the chemist shop, Mr Balcomb manufactured chemicals and sold scientific apparatus. In 1894 he was able to include the telephone number 14 in his advertisements, at a time when very few traders were connected to the National Telephone Company exchange in Regent Street. By 1914 he owned the neighbouring property at number 9 Suffolk Parade. 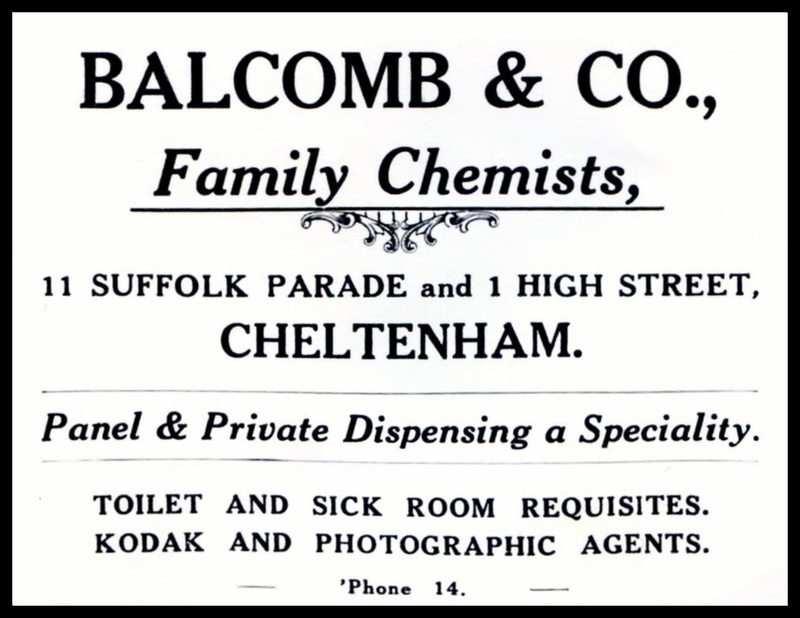 John Balcomb died on 28th July 1918, at the age of 77, but Balcomb & Co family chemists continued at 10 & 11 Suffolk Parade until 1921, when the premises were acquired by Mr Herbert Oliver Lloyd. He continued the chemists shop at number 11 for a short while, before leasing it to another chemist called Arthur T. Willis. In the meantime number 10 became Wooleys, ladies’ outfitter and then Mrs Nellie Hildred Lloyd, ladies outfitter. By about 1930 the chemist business seems to have been closed and Wooleys Knitted Wear occupied both 10 and 11. Then, during World War II, Mr Lloyd appears to have had a change of mind and the shop returned to it's earlier function by becoming H.O. 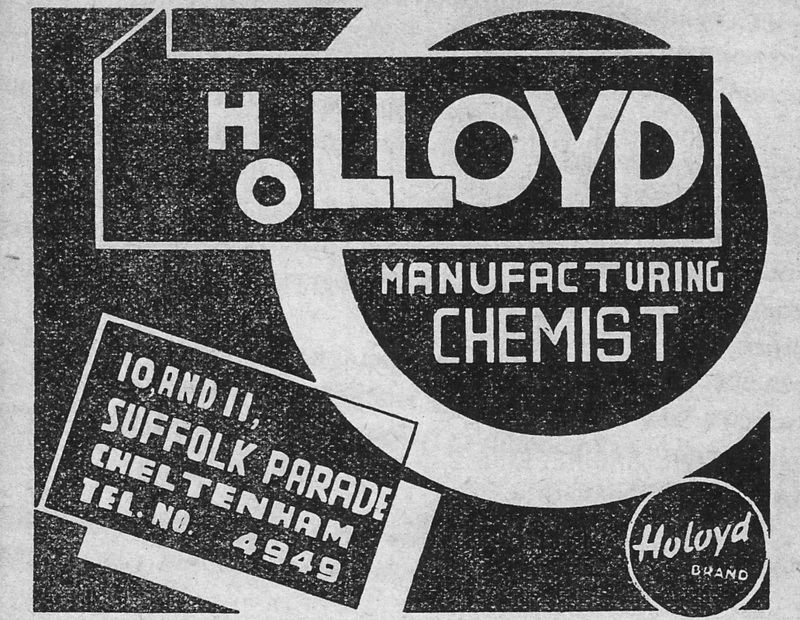 Lloyd (Cheltenham) Ltd, manufacturing chemists. By about 10 years later, although the residential quarters above the shop were still occupied by Mrs Lloyd, the chemists had once more gone. Both 10 and 11 were by then given over to a company called Quality Candies (R.T. Hickling, Proprietor), who manufactured sweets and sold them wholesale & retail. By 1961 the sweet manufacturer had moved on and the building was divided back into two shops. Number 10 was run by Patricia Preece, a floral artist, whilst number 11 was "Gay Dogs", which sold all the things that a dog might need. Patricia Preece had extended her range to include aquatic gardening by 1965 and later in that decade expanded into number 11. There was another complete change by 1975 at which time the Four Seasons Carpets (Wholesale) Ltd company was here. That stayed for just a few years and by 1980 the property belonged to a Canadian couple called Mr & Mrs Murphy who, amongst other talents, were professional stage magicians. They ran number 10 as a licensed cafe and picture gallery, whilst in number 11 was "Ports O'Call", a shop selling assorted bric a brac. 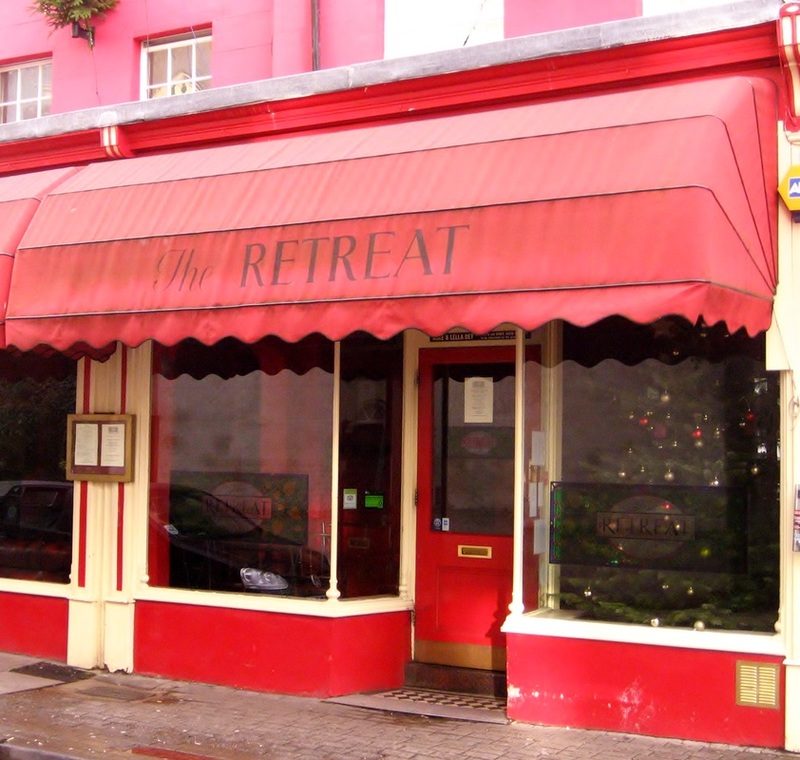 In December 1982 Mike and Lella Dey bought the property and recombined numbers 10 & 11 to form The Retreat wine bar. Suffolk Lodge in 1857. 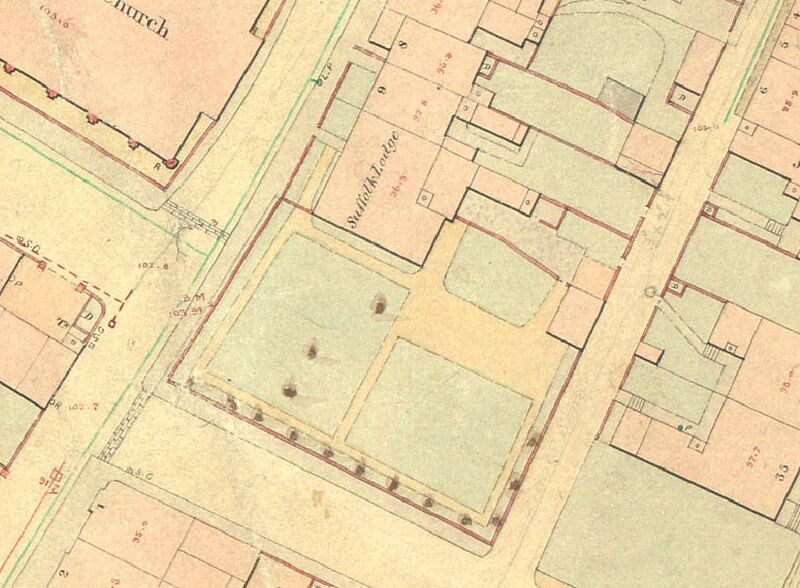 Detail from the Old Town Survey.